Graland periodically hosts special events for young alumni under the age of 21. Whether in high school or college, or pursuing other life goals, we want to stay connected. Complete our Class Notes form and let us know what you've been up to. 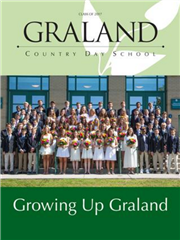 Learn more about upcoming Graland alumni events. Questions? Email alumni@graland.org. Click image to link to the Class of 2018 keepsake.